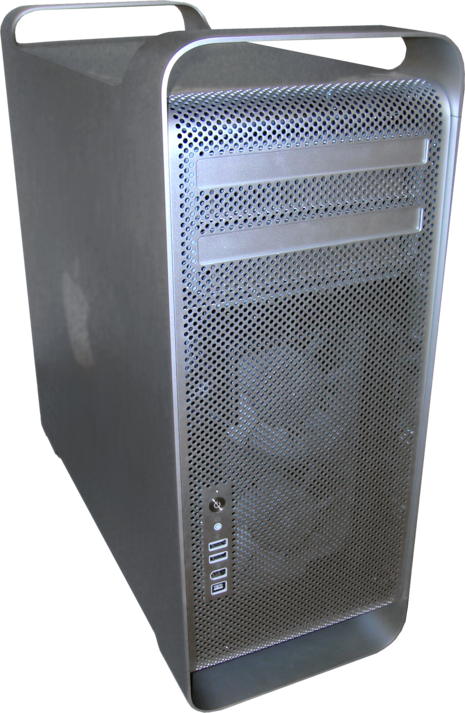 An Intel-based replacement for the Power Mac G5 had long been expected prior to the release of the Mac Pro. The iMac, Mac Mini, MacBook and MacBook Pro had moved to an Intel-based architecture starting in January 2006, leaving the Power Mac G5 as the only machine in the Mac lineup still based on the PowerPC. Speculation about the G5's eventual replacement was common. Rumors initially expected the machine to differ physically from the existing G5 and considered a number of different possible internal configurations based on different chipsets, but the coincidence of Intel releasing a new Core 2-based Xeon workstation platform just prior to the 2006 Worldwide Developers Conference (WWDC) made it fairly obvious that the resulting machine would be based on it. Even the naming was "obvious"; Apple had dropped the term "Power" from the other machines in their lineup, and started using "Pro" on their higher-end laptop offerings. As such, the name "Mac Pro" was widely used before the machine was announced. The Mac Pro is a high-end computer, similar to higher end Unix workstations from vendors such as Sun Microsystems. Although the high-end technical market has not traditionally been an area of strength for Apple, the company has been positioning itself as a leader in non-linear digital editing for high-definition video, which demands storage and memory far in excess of a general desktop machine. Additionally, the codecs used in these applications are generally processor intensive and highly threadable, speeding up almost linearly with additional processor cores. Apple's previous machine aimed at this market, the Power Mac G5, had up to two dual-core processors, but lacked the storage expansion capabilities of the newer design. In order to serve this market, Apple sells a variety of standardized bundles combining a Mac Pro with fairly high-end components; for instance, all available setups can support the 30" Cinema Display. In general, the Mac Pro has been well received in the press. The combination of high performance, reasonable expandability, very quiet operation and superb mechanical design makes it routinely appear as the comparison system against which other systems are measured. The Xeon platform is, however, Intel's "high end" system and not aimed at more general purpose use. Nevertheless, current-generation Xeons are priced competitively with their high-end desktop platforms, allowing Apple to sell a very powerful system at price points that are considered quite competitive, even by reviewers who do not normally review Apple systems. Original marketing materials for the Mac Pro generally referred to the middle-of-the-line model with 2 × dual-core 2.66 GHz processors. Previously, Apple featured the base model with the words "starting at" or "from" when describing the pricing, but the online Apple Store listed the "Mac Pro at $2499", the price for the mid-range model. The base model could be configured at US$2299, much more comparable with the former base-model dual-core G5 at US$1999, although offering considerably more processing power. Post revision, the default configurations for the Mac Pro includes one quad-core Xeon 3500 at 2.66 GHz or two quad-core Xeon 5500s at 2.26 GHz each. The Mac Pro is the only machine in Apple's lineup with industry standard PCI express (PCIe) slots for graphics cards and other expansion cards. Apple introduced the Mac Pro as a fully customizable quad-core computer. The buyer can choose from two dual-core Intel Xeon ("Woodcrest") at 2.0, 2.66, or 3.0 GHz. As little as 1 GB of RAM or as much as 16 GB. 160, 250, or 500 GB in drive bay one, and optionally 500 GB in bays 2-4. For graphics, nVidia GeForce 7300 GT is the default, and you can add one, two, or three more. Or choose an ATI Radeon X1900 XT or nVidia's top-end Quadro FX 4500.